Nineteen new auxiliary midwives have completed their training and will bolster rural health teams in an aim to reduce maternal mortality in Karen State. The 19 trainees were presented certificates at an inaugural ceremony on September 6. These auxiliary midwives are the sixth batch to complete the seven-month training held by the Backpack Health Worker Team (BPHWT), the Phalon Education Development Unit (PEDU). Complications from childbirth and pregnancy are a leading cause of death for women in Burma. The country has the second-high maternal mortality rate in the region, behind Laos. Countrywide, an average of 282 women die per 100,000 births, according to data from the 2014 census. One in three births in Burma is not attended by a healthcare professional, and access to emergency services, especially in more remote areas, remains low to nonexistent. The BPHWT and PEDU are trying to fill the gap with midwives. Since 2012, 110 trainees have completed their program. The training covers neonatal, antenatal and delivery healthcare services. The most recent training was held from November 1 to August 31, with three months of theory lessons and four months of practical training. The theory was taught by members of the BPHWT, retired government health trainers and members of the state’s Department of Health, while the practical lessons were taught at the Mae Tao Clinic in Mae Sot, Thailand. “During the practical training, a trainee must successfully deliver at least five babies. She must care for 15 pregnant women. The areas where we work are very remote. It’s difficult to send people to hospitals and clinics. We expect [the midwives] to provide [comprehensive] care,” said Saw Win Kyaw, director of the BPHWT. 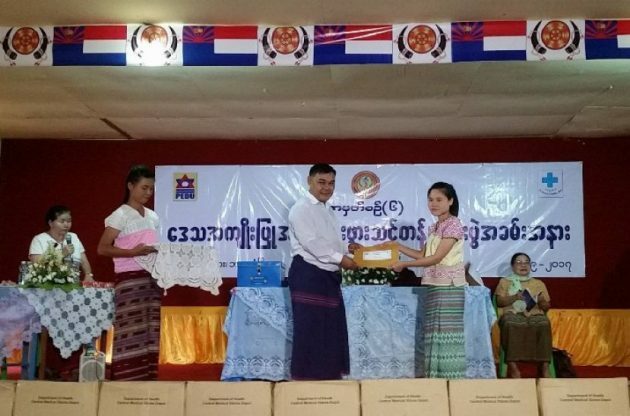 The training completion ceremony was held at the Taung Kalay Monastic School in Hpa-an township, Karen State.